It’s been another almost five months since I’ve done a “favorite products” version of Tuesday Tattles. My little man is now 16 1/2 months old. A lot has happened since he’s turned one! He is more sure footed than ever, except for when he’s tired, and is a happy explorer. He can run, although not exactly gracefully, and enjoys running away from us to see if we’ll get him! But his number one activity is climbing. He’ll try and climb up on anything! I’ve caught him on top of my crafting table, laying next to my sewing machine. Chairs now have to be kept at a distance or tucked too far under the table to be of use. His vocabulary has expanded from “duck” to include “all done”, “uh oh”, “up”, and “okay.” He is getting great at communicating when he is hungry too by running to the fridge and yelling “MAOW”. His favorite foods include sandwiches, berries, bananas, and the food that gets a happy dance, cheese. Now on to the favorite toys of my one year old. A lot of today’s items are those he got at his first birthday. My family had some great ideas so if you have little ones on your holiday shopping list pay attention! 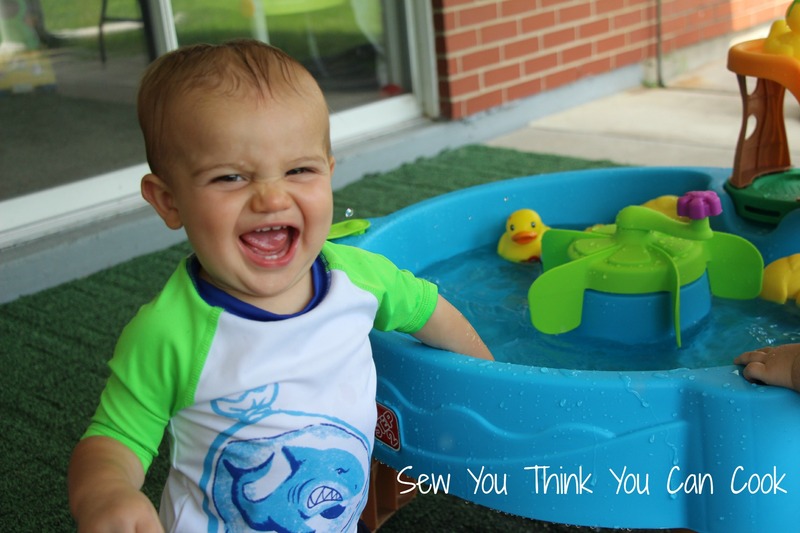 A splash table is a fun warm weather activity and when I saw one that was duck themed I knew I had to get it! (Duck was my little man’s first word and he still loves rubber ducks and the duck stuffed animal I had as a child.) My son loves water – baths, showers, washing his hands. It’s getting too cold now but I know when it comes back out of the box come late spring he’ll find new enjoyment with it. This marching band car is a huge hit! He loves to press the music making buttons, push it around the house, sit on it and be pushed, sit on it and scoot around himself, and of course, try to fit himself in it. Surprisingly he still hasn’t put anything into the seat cavity, other than to immediately pull it out. Maybe with a little brother around he’ll re-discover the compartment as a place for safe keeping. 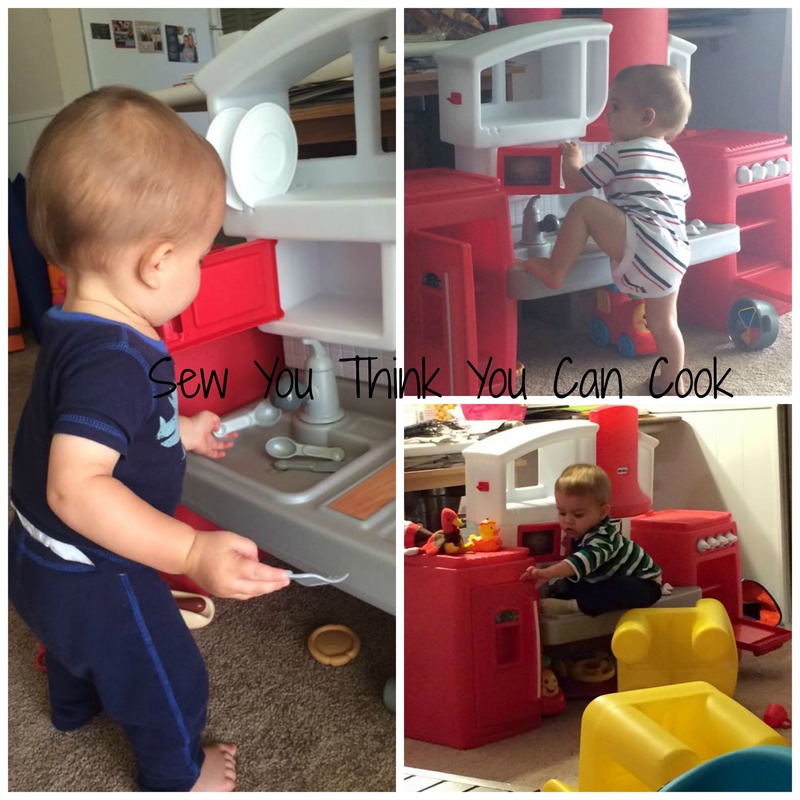 A play kitchen is a perfect toy for a food blogger’s kid! And I’m happy to report that a lot of independent play has been developed through his play kitchen. (Allowing me to wash dishes peacefully.) He will bang the dishes, open up all the doors, and naturally try and climb it. This particular model comes with a shape sorting pot and it’s one of his favorite activities. All of the accessories do create a bit of a mess, but what’s a home with a toddler without a little clutter? We found this classic table and chairs set at a consignment shop in fantastic shape, so I jumped on the chance to bring it home. 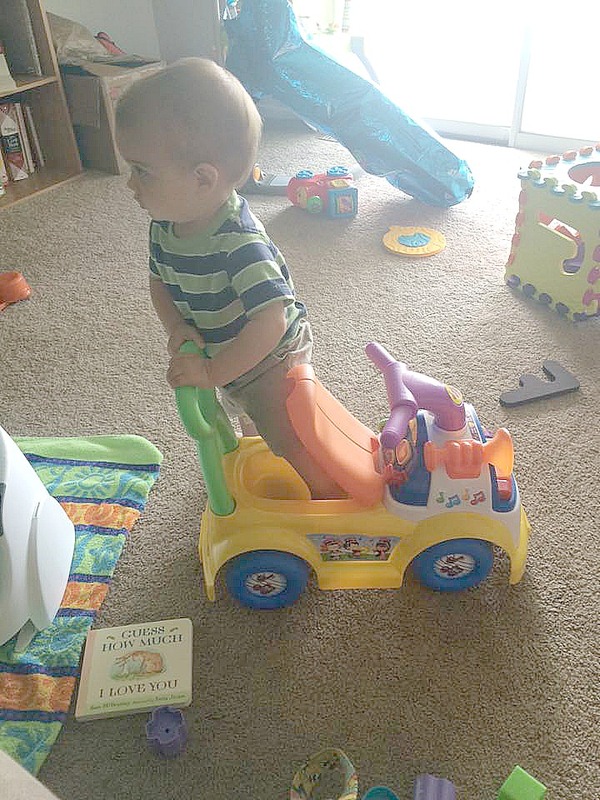 I thought he was still too little to really use it but I was proven wrong within ten minutes of having it home. 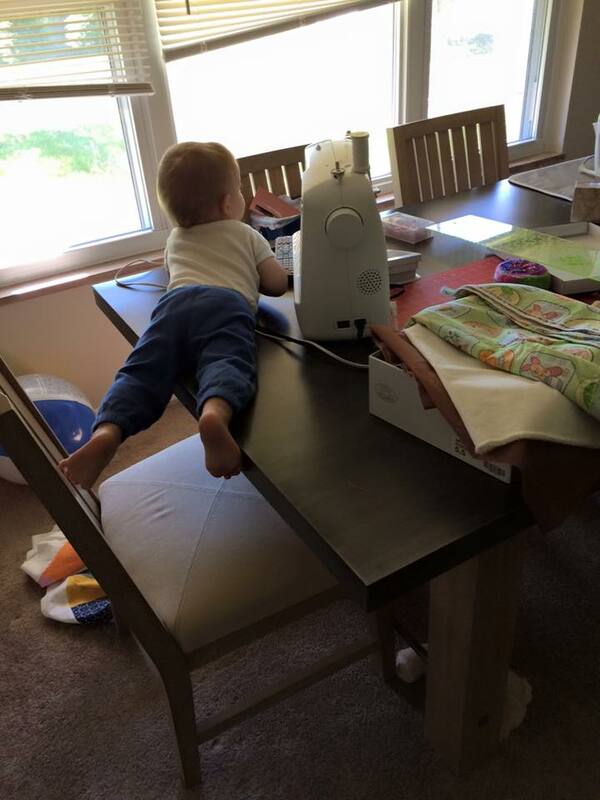 He had immediately climbed up on top of the table and stood up. It was kept upside down for a while after that. 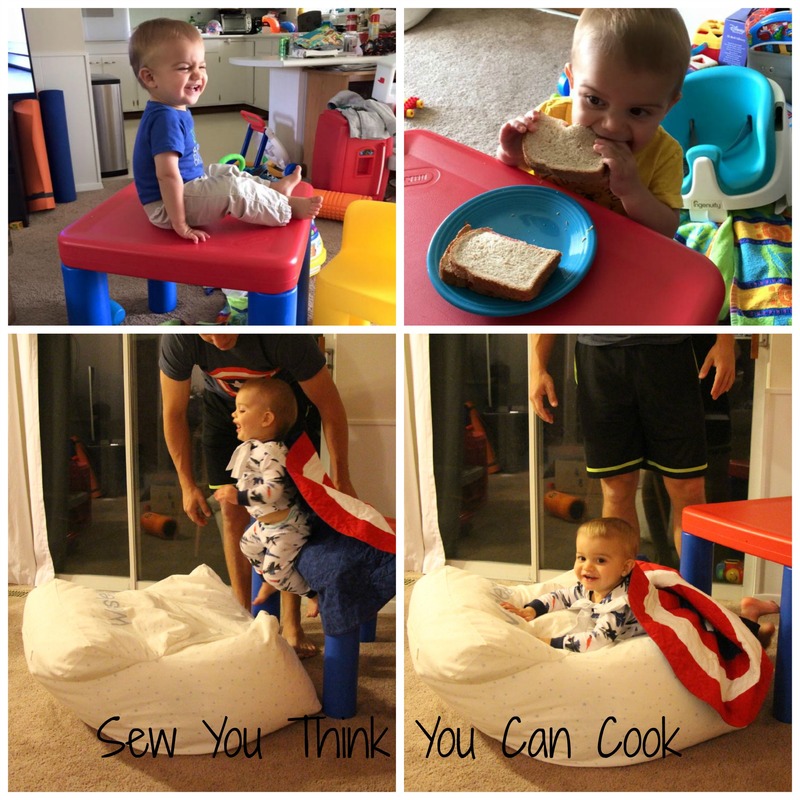 And when he got tired of being in his booster seat I found he’d eat a sandwich like a big boy at his table. Turns out the table is also the perfect platform for superhero practice with Daddy. Until quite recently my little man much preferred destroying towers as to building them but now he’ll stack a few before taking them apart. He likes to bring us the bag to open up and build with him, although the creativity and endless hours of fun are still a ways away. This abridged version of the classic is definitely my 16 month old’s favorite book. We read it at least four times a day.